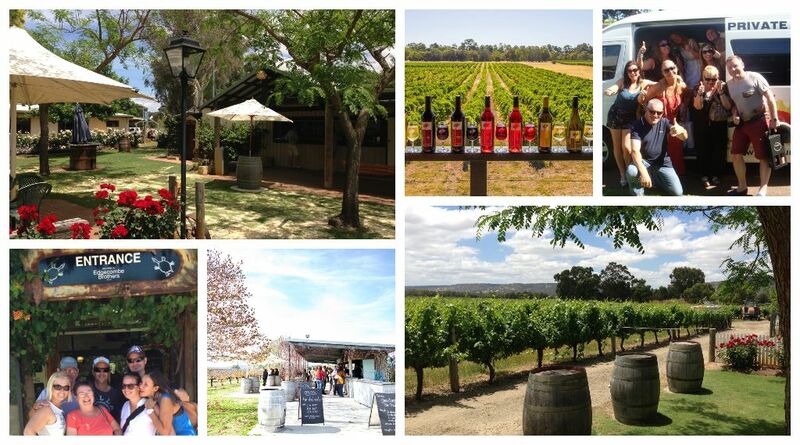 Please note wine tastings + lunch is at your own expense payable on the day of the tour. Swanbrook wines are bottled locally and have some amazing fragrances and flavours. Enjoy Red and White wine tastings + wine infused sorbet sampling. Fourth generation winemaker, Anthony Yurisich makes a diverse range of Swan Valley wines at this award-winning cellar door in the heart of the valley. Over 25 premium wines are available for tasting with a friendly, relaxed and personal experience perfect for enjoying some of the best of what the Swan Valley has to offer. A charming, rustic cottage overlooking the vines is home to their small boutique vineyard and cellar door. Premium wines, all locally grown and crafted, coupled with old-fashioned service and a friendly smile is what you’ll find at their popular spot. Established in 1840, Sandalford Wines is one of the oldest winemakers in Western Australia. As well as five stunning wine ranges, the Cellar Door is brimming with everything wine related from premium glassware, bottle openers and other ideas to local gifts. The new cellar door is set in the lovingly tendered vineyard with the Darling Ranges as a backdrop. Tony and Ruth invite you to come along for a chat and a taste of their range of wines and fortified wines. Enjoy FREE Borrello Cheese from one of Western Australia’s premium cheese makers. All the grapes are hand picked and basket pressed producing traditionally made handcrafted wines full of flavour and character. Enjoy Sparkling Chenin on arrival, pink lady Apple Cider, 3 white and 3 red wines and finish with Shiraz Liqueur. Free wine tastings if eating in the restaurant. Family owned and operated boutique winery, on the banks of Perth’s Swan River. Enjoy a wine tasting at their crisp, clean Cellar Door with huge views of the vineyard. Tasting fee redeemable off a purchase of wine. Enjoy free wine + chocolate liqueur tastings. Enjoy local produce tastings – their vineyards, organic olive grove, orchards and vegetable gardens provide them with an array of produce such as home-made jams, preserves, olive oils, sauces, dressings, spice mixes and desserts. For over 40 years now, the Atkinson family has been passionate about making beautiful, high quality wines. With a range of premium varietal wines, sparklings and rare old fortifieds to offer, there’s something for everyone. Sittella offers free wine tasting for individuals and small groups. Any groups more then 10 people will incur a tasting fee. Verdelho, Chardonnay, Shiraz, vines grow over a 5 hectare allotment on rich alluvial sandy loam soils (3 hectares under vine). Recent plantings also include Tempranillo, and Petit Verdot. Family vineyard and winery was established in 1977. They offer authentic wines, they let the fruit dictate the style of the wine. They enjoy creating a rainbow of flavours to tickle your palate. Old Young’s is an Award Winning Gin Distillery located in The Swan Valley. Enjoy 5 x vodkas and 1 x gin tasting. Pandemonium Estate is a small, boutique Swan Valley producer of table and fortified wine that was established in 2008. Open Saturday, Sunday and public holidays (December open Fridays too). Gin tasting is $5 p/p to try 3 artisan gins, which they make on site in small batches (available for groups of 6 or less). Located at Mandoon Estate it has a relaxed vibe with a varied menu. A delightful way to spend some time with friends in a relaxed environment with picturesque views over the grounds. Choose to dine in their eclectic industrial style restaurant or on the patio while you partake in a bite to eat. Posh Picnic Basket – Famous for their delicious platter lunch, which includes fresh home-made local produce to share (each basket serves 2), served in a basket which is just like a ‘posh picnic’ enjoyed at your table. Farmhouse Terrine, Jane Brook Pate, Seasonal Frittata, selection of JB Pantry Bites, Smoked Salmon, Smoked Chicken, Vintage Cheddar, Creamy Brie, Two Fresh Salads, Local Olives, Dip, Chutney, Seasonal Fruit, House Baked Sourdough. Woodfired pizza is $15 or $25 with 2 glasses of wine. Platters are $40 for two people and include cheese, ham, salami, pie or quiche, chutneys and salad – served with biscuits and bread. Beer garden menu (burgers, wood fired pizza, nachos). Ironbark Brewery is Perth’s casual, laid back beer garden and dining location. They keep a range of high quality, award-winning beers and ciders on tap as well as offering premium meals and snacks for all to enjoy. Fine Dining – in this tranquil setting with valley and vineyard views from the verandah, visitors are invited to enjoy fine dining and award winning wines. Imaginative architectural work has brought together artistic qualities and practical spaces in a splendid earth-rendered winery that has become another ‘jewel’ of the Swan Valley. Fine Dining – Wild Swan is a contemporary fine dining restaurant, overlooking the manicured gardens and the Llawn at Mandoon Estate. Executive Chef Michael Hartnell and Executive Sous John Baxter have created modern and innovative a la carte and degustation menus that combine classic techniques with the finest local and seasonal produce. Their modern Australian menu has been carefully designed to match with our award winning wines and craft beers. In a quiet corner of the Swan Valley and is something of a treasure. From small tasting plates to large feasting platters and a la carte options, RiverBrook offers sensational fresh seasonal food in a relaxed quiet setting, taking in the sweeping views over the Upper Reach vineyard. Expect distinctly un-cafe dishes such as savoury churros with jamon, caramelised pear and Cambray blue cheese; Margaret River wagyu with green mango, crisp fish and hot and sour sauce, and fritters of queso Mahon (a Spanish cows cheese) with charred corn, avocado and jalapeno mojo. On the dessert menu, the rose and chestnut features a curd made using verdelho juice pressed in the winery (the juice is also used in dressings). Dishes change seasonally but count on West Australian produce to feature prominently. Picnic boxes are also available from the cafe. The entire grounds are licensed, so wine can be purchased at the cellar door and customers can set up camp under the old Jacarandas or Norfolk Pines to dine and drink. Australian & Mediterranean cuisine – Husband and Wife owned and operated business. Set amongst the vineyards of the surrounding estates, and overlooking a picturesque dam, Penny Garden is the perfect place to enjoy a group luncheon. Taking inspiration from Australian and Mediterranean cuisine, they have created a menu that is family friendly and unpretentious, whilst still offering indulgent, delectable options. Fully licensed, with BYO and “SPLIT BILLING”. Great food options that cater for most diets and tastes. Famous for their burgers with homemade beef or chicken patties infused with a red wine reduction or marinated in white wine. Enjoy lunch with a glass of wine of your choice (and lunch includes the cost of wine tastings). Feast on nibbles of dip, crackers, olives and stuffed pepperdews, followed by antipasto skewers (2 per person) and pizza (1 pizza per 2 people) and a green salad. Enjoy a choice of cheese platters to share. The Big Board (serves 4 – $70) includes 5 cheeses, freshly baked bread, crackers, house dip, ham, olives, fruit paste and seasonal fruit. Ploughman’s (serves 2 – $40) includes 2 cheeses, freshly baked bread, salami, ham, tomato relish, piccalilli and seasonal fruit. Best of the West (serves 2-3 – $45) includes 4 local cheese from Western Australia, freshly baked bread, crackers, fruit paste and seasonal fruit. We would like to thank the team at Happy Go Lucky Tours for their brilliant service on more than one occasion while we were recently trying to get to Bali around cancelled flights. Frans, Arnold and Tanya - you were all very helpful and kind, and we also thoroughly enjoyed your company during the multiple journeys. Your service is excellent value for money and we will definitely be calling upon your services again! Thank you! Terry and Debbie. Based in Perth, Western Australia (ABN: 67 143 290 427). We have our Australian Tourism Accreditation. We've met the specific criteria and we've earned the tick!